Time for Read Aloud Thursday over at Hope is in the Word. There are a whole lot of books in the Felix series. 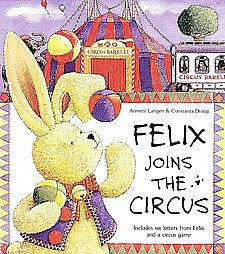 The other one that we have is Felix Joins the Circus . In this book Sophie loses Felix when they attend a circus performance together. Once again Sophie begins receiving letters from Felix from all around the country. Naturally, Felix returns at the end of his adventures and the two are reunited. Really, these books are a cute idea and it really would be a shame if they weren't kept around a bit. 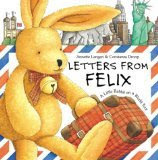 If you can find the Felix books, a fun idea for enforcing the concept of travels and correspondence is the Mailbox Treasure Hunt Party Game from eeboo.. It's a simple game and easy for toddlers or young children to grasp the concept of. The idea is to be the person who delivers the most mail. There are eight mailboxes and 20 letters to be delivered. Each mailbox is marked by an animal (i.e., a lion or a giraffe) and there are appropriately matched envelopes. You place the mailboxes around the room and have the children (or child) deliver the letters to the proper mailbox. This game is marked as a party game but wouldn't require all that many children to play. I like it because it's simple with a concept we can identify with (receiving mail!) and involves sorting and organizing. It is helpful and useful in that respect. And the little guy likes the idea of getting to put the mail in the mailbox (as our actual and real mailbox is too high for him to reach)! Mail is a fun concept for us (as well as traveling) making both these books and the game lots of fun. Now who do we contact to keep the Felix books in print!?!? The game sounds like lots of fun, too. My girls got Cooties for Christmas, so we've been having fun with that. I'd contact the publisher (or former publisher?) and make the request known. If anything, it indicates that people are reading the books and that there is demand for them. Another consideration, though, might be that the books are between prints -- the original publisher might be reprinting them or might have sold the publication rights to another publisher. Believe it or not, there is a slight advantage in all of this. I own a book that was fairly inexpensive when I bought it but is now worth about 20x as much because it's briefly out of print. The Felix books could easily become collector's pieces for a while.